KG is amazing to work with. He sat with my wife and understood her style and her desires for her new wedding set. He picked the perfect diamond and designed the wedding band and engagement ring and she was extremely pleased with it. KG listens well and accepts all feedback from the customer for this most important purchase in the life of his customers! Highly recommend!! Thank you, KG! KG does wonderful work at prices that can't be beat. He and his family are some of the nicest people you'll ever meet. I'm a customer for life!! KG is an absolute jewelry expert! I brought him my old wedding rings and some other old rings I don't wear anymore and an idea of what I wanted made. He drew up a picture of a hurricane ring that turned out absolutely perfect. He even engraved my name on the ring. I recently went back and had earrings made to match and they also turned out a perfect match to the ring including my name on them! We have been going to KGs for at least 15 years with our jewelry for repairs and stuff. He also created a cross that turned out awesome as well. If you want the best go see KG! First class experience from start to finish! I recently bought an engagement ring from KG's and I could not be happier. I did not know much about the process of buying a diamond and determining a setting, but KG was very informative and helpful the whole way through. The end result was a ring that my fiancé and I are extremely happy with. Great service, great attention to detail, great pricing. I highly recommend KG's Jewelry!! You can find less expensive diamonds elsewhere... Lacking in quality.. But if you are looking for great quality AND great prices then KG's is the place for you. He hand selects his stones and brings them to life through his creativity. KG is extremely talented and if a one of a kind piece is what your looking for, look no further. Bought an engagement ring from him. Like others have said don't let the location fool or scare you. He is a great jeweler and I will do business with him again. I could not be more pleased with the ring KG created for me! This man is just short of being a mind reader, and nothing short of being a fine artist of his craft. His business and staff deliver honest, top-shelf customer service and satisfaction. Highly recommended! KG made my engagement ring from an heirloom necklace and I absolutely love it. He was able to create exactly what I had imagined and was friendly, knowledgeable, and all around wonderful to work with. I highly recommend him for any of your jewelry needs! K G's is truly the best of the best! My entire family has been doing business with KG ever since he went into business. You can not find any more honest, affordable or talented jewelers any where. 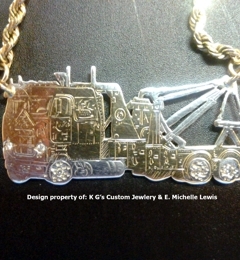 Over the years my father had KG design several custom peace's of jewelry for him and my mother. Needless to say since my father has passed away each one has become such a treasure. I would never trust anyone else with any of my jewelry. My family and I have been competing to this company for many years, he has made some amazing pieces for my family, after my grand father died I got him to make me a tow hook pendent, it came out amazing and means so much to me. I have been engagement ring shopping for a year and a half. I have been to just about every store in BR. KG's is a little shop off of Florida blvd, but do not let the location fool you. This man makes the the most beautiful rings in the city. He is also down to earth, honest, and being the owner of the store took thirty minutes to talk to my fiancée and I even though we were not ready to buy. DO NOT PURCHASE YOUR RING W/O VISITING KG FIRST!!!!!!!! I recently was looking to purchase an engagement ring and KG Jewelers was recommended to me by several people. My experience with his businesss could not have been any better, KG worked personally with me to find the perfect ring. I am so glad I chose KG Jewelers for my purchase and I will continue to use his business for all future purchases. The ring I selected was beautiful and everything I asked for and more. His business is professional, curteous and top notch and would highly recommend to anyone. Thanks KG! After dealing with many jewelers in town, KG is by far the best jeweler I have ever delt with. Customer service is a number one priority to him along with the beauty and detal of his work. He recently custom built my wife a new wedding ring that looks absolutely stunning. From the minute you walk in the door to picking up the finished product KG and his staff take care of all the fine details involved. Thanks KG and staff for delivering a ring that my wife will cherish forever!